It would be easy to conclude that different people like different things, but sometimes a single person may like many different things too. You might be in love with antique furniture but, at the same time, a modern piece may catch your attention too. This doesn’t mean that you have to change the way you have decorated your home, you just need to find a way to mix these styles. Although this idea is very thought provoking and unique, but it might sometimes be hard to pull off. Following are some easy tips that might help you merge traditional and modern décor in a subtle and brilliant way. One of the easiest way to include a traditional vintage piece into a modern décor is by updating it. But do not renovate antique furniture to its novel form. You can give a contemporary touch to the old furniture pieces with the help of fresh coat of paint and brand-new upholstery. For old accessories, you can use funky fabrics, patterns, unconventional colours for a modern update. When mixing traditional and modern décor, mixing woods is an important factor. For a formal look, consider mixing mahogany, cherry and oak. For casual look, mix pine, maple and bamboo. If you have an open space and you require more than one rug, be sure to select carpets that complement rather than matching. So consider various styles in modern and traditional patterns and choose the ones that harmonize each other for a brilliant looking décor. A modern family room that is dressed up with monochromatic neutral fabrics should be complemented with some large floral patterned pillows to add a touch of traditional décor. 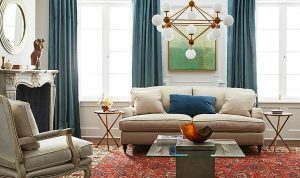 Similarly, a traditionally setup space filled with patterns needs some space to breathe, so incorporate solid spans of color. ← Choose the Right TV Unit!! A beautiful family home in Hyderabad!! Cabinets in Motion: Get impressed! !